Eric Dungey reacts after making a throw against Wagner. Mandatory Photo Credit: Kicia Sears, The Juice Online. Item: As Eric Dungey barreled his way to his second of three rushing touchdowns late in the second quarter of this past weekend’s 42-21 blitz of Boston College, we again thought back to last July’s ACC Football Kickoff event in Charlotte. The visual in our mind of the pained look on Dungey’s face, and the strain in his voice, as he protested with the media crowding around his table that he certainly wasn’t going to settle for a minimum of six victories to finally qualify for a bowl game. No, he was thinking much bigger than that. We’ll be up front. We were going to write this article a week ago heading into the Boston College game, not sure if Dungey, looking like he was in excruciating pain at Yankee Stadium several days prior, was even going to play in his regular season finale, despite the multiple hints Dino Babers dropped at his Monday (11/19) press conference including his senior leader getting into a shared hot tub with himself and Tommy DeVito “on his own” the day after the Irish loss. But that was foolishness. 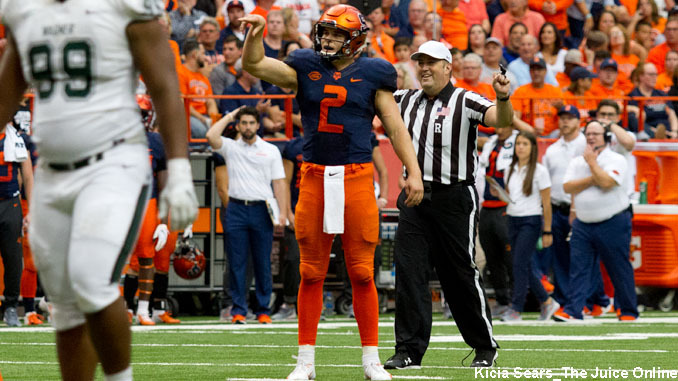 Eric Dungey was not going to miss his final regular season game in a Syracuse uniform, and he said so himself after his dazzling, school record-tying, six touchdown performance (three rushing, three passing) against the dazzled Eagles. Which leads to the question how on earth could Eric Dungey not be the first or second team all ACC quarterback? When the results were announced midday Monday, N.C. State’s Ryan Finley (the Wolfpack will finish either 9-3 the same as SU, or 8-4 after playing East Carolina Saturday) was the first team choice, freshman Trevor Lawrence of unbeaten, No. 2 ranked Clemson was the second team selection, and Dungey the third team QB. While it appears to these eyes to be statistically driven, Finley and Lawrence did have higher numbers than Dungey in most, but not all, passer rating categories, by a media base (46 media voters) centered in the Carolinas and Virginia, it was Dungey who was named the ACC Quarterback of the Week four times in the 13 week season, and neither Finley or Lawrence won the award one time. That’s a third-team, all-conference resume? We always made the comparison of Dungey to the great 1970s Orange quarterback Bill Hurley (1975-77, 1979). Athletic and tough, each with the ability to singlehandedly direct a Syracuse offense to be competitive against perhaps a more talented defensive opponent. Each also waited three long seasons, with both suffering injuries at points of their Orangemen careers, before departing with a bowl game appearance in their final year of eligibility. Like Hurley, who went on to have a four year NFL stint as a defensive back with Pittsburgh, New Orleans, and Buffalo from 1980-83, we’re not counting out Dungey from playing professional football (Canadian Football League?) after his record-setting Syracuse career finishes in the Dec. 28 Camping World Bowl in Orlando.